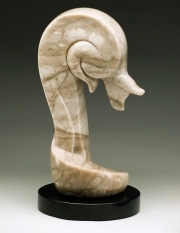 I began sculpting in stone 13 years ago, with an idea to create stylized animal designs. 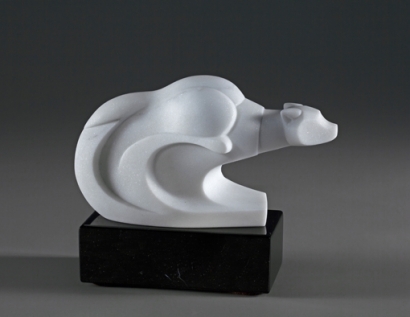 I created sculptures that incorporated my love for animated movement with simple design elements and clear lines of action through the pose—much like the basic designs of animated characters who are composed from simple shapes. “Pounce” was the third sculpture I made, and it embodies those ideas. Pounce. Photo by Jim Digby. I wanted to use the medium of stone as an integral part of the sculpture. The piece was as much about the stone as it was about the animal. My artistic journey is not a straight-line trajectory. Branches and sidetracks happen to answer creative questions and to explore possible ways for my style to develop intellectually and take physical form. It is a necessary process for me that comes from confidence (or lack thereof) and self-challenge. Can I do this? Well, let’s see . . . The artistic challenge is a very strong motivator for me. There is a personal excellence that I need to achieve with my work. (If I can please myself, I reason that others will be pleased with my sculpture as well.) If I can come close to a realistic portrayal of an animal then I achieve a level of skill in proportion. It is akin to the importance of life drawing. If you can draw the human figure accurately, then you have achieved a degree of observation, recognition, and technical skill. Degrees of realism in art are in the eyes of the viewer. 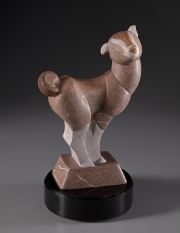 I believe I needed to prove to myself that I could create a stone sculpture of an animal that looks very much like that animal, though others may see the piece as quite stylized. I think it is very important that I passed through a personal version of realism on my artistic journey. It gives me confidence that I do know my subject inside and out, and I can create it. “Force of Nature” takes me forward to my initial philosophy that art is the interpretation of the subject, not a realistic presentation. The pose in “Force of Nature” is one extreme in the run, the squash, the maximum storing of energy in the linked movement of running. This pose leads to the maximum release of energy in the stride forward, the stretch. I have carved this pose several times: in “One For All” (African wild dog) and “Run!” (two Alaskan wolves). I know I will use this pose again; it is the key element in the sculpture I am currently making. The shapes and the energy in this pose of extreme anticipation are very exciting to me. One For All. Photo by Mel Schockner. Run! Photo by Mel Schockner. The pose also allows for another use of the stone as an ingredient in the feeling of forward power, like the blur or speed lines in animation. This is the pose as pure movement. Force of Nature also shows movement within the pose. But more calm poses also have designed movement that keeps the viewer’s eye circulating through the sculpture. “Simplicity” is one of my favorite examples of this. Simplicity. Photo by Mel Schockner. Sculpting stone is a journey of discovery for me. There is always more to learn, and always more than one way to realize a creative vision. The completion of one sculpture raises new questions, new ideas, and new ways of looking at an animal, a design, and a pose. It is a never-ending conversation with myself, the medium of stone, and the animals I love. The goal is perfection in meaning and execution. But, perfection is elusive—once you think you’ve reached it, you know you haven’t because you can always go farther.